If you look at a map of Hicks Road, near the dump, you'll see something called Pheasant Road. If you look at a terrain map, you'll see it heads up into the Santa Cruz mountains, onto the shoulders of El Sombroso. If you look at a satellite image, you'll notice that while there's a house near the bottom of the road, toward the top there's nothing. I saw all that, and because I also looked at the highest resolution satellite image, I also saw that there was a gate across the road, maybe a third of the way up. I can't claim I was surprised. 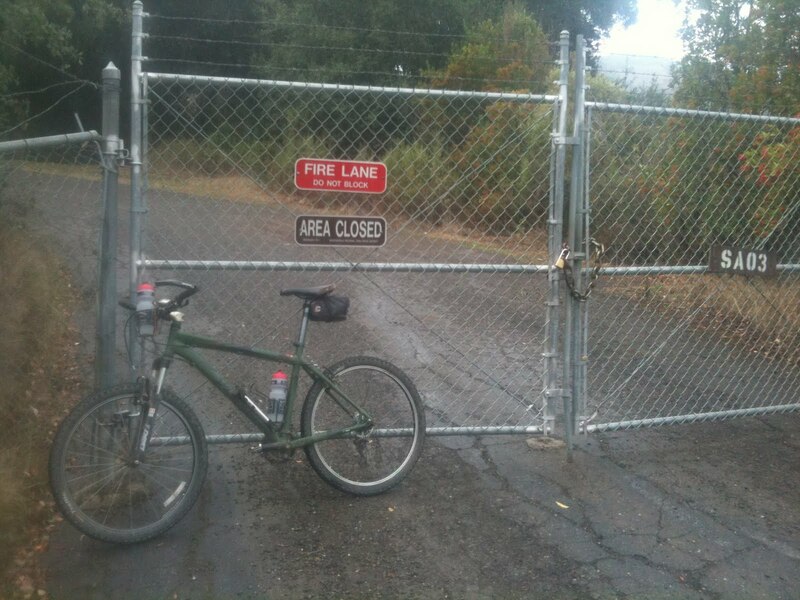 Still, I wanted to explore the area, so on a beautiful cloudy October day I rode my mountain bike up to the gate. 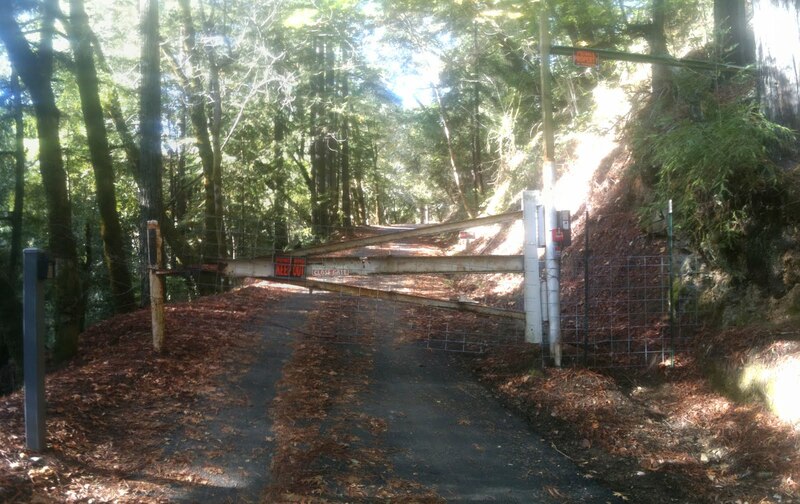 At the top is a driveway and a gate. The gate, much to my surprise, had MROSD markings, as opposed to private property markings. That's an important factor in both my rationalization, and my practical chances of getting caught. 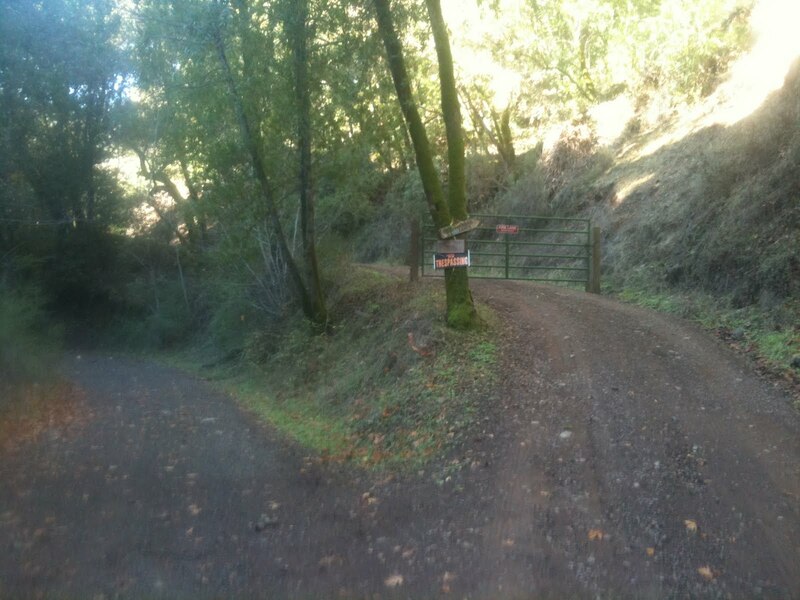 As it turns out, if you're willing to deal with a little poison oak you can get around the left side of the gate. From there it's a pleasant, well built road heading southwest, and gradually up. Midway up this section you come across a tree stuck right in the middle of the roadway. I'm glad the road builders had a bit of sense of humor so this tree didn't have to come down for the sake of this completely unused road. Still, it's hard to imagine what they were thinking. It's also a reminder that asphalt is pretty porous. A little farther up, one comes across a patch of brand-new, deep black asphalt. I was breaking a rule or two, and consequently nervous. The new asphalt made me more so. Was something being built up ahead? There was nothing on the satellite images, but those were taken years ago. The new asphalt is next to a little clearing with a great view over the houses on Arnerich Road. The road takes a sharp turn and heads up steeply. This section is very rough and broken, which may explain why the previous section was repaved. It ends at a little T-shaped body of water, clearly visible on the maps, that turns out to be called Cherry Springs Pond. All around this area the woods are cleared. As it turns out, what I'm looking at is a failed housing development that got as far as clearing some land (and presumably building the artificial-looking pond), but not as far as actually building houses. This must have happened prior to 1993, based on Google Earth images. Later, it was sold to the open space district, and remains its own sort of ghost town. A ghost neighborhood, perhaps. At this point I was pretty much done with what I wanted to accomplish. But what a glorious day. Cloudy, a little foggy up here at 1100 feet, and I felt great. A little jazzed about breaking the rules. The paved road continues up past the lake a bit. How far? Well, let's find out. As it turns out, not far at all. The pavement ends just behind the next hill, but the road continues unpaved, and steep. It reaches a second cleared area, which on the satellite image looks like a large oval with a road around it. In reality the oval "road" is just dirt surrounding slightly looser dirt. I rode around it just to see if there were any surprises. There weren't. If this area was cleared in 1993, why hasn't it been reclaimed? Do no seeds blow onto this apparently fertile dirt? Nearer the pond there is the appearance of cut grass, like a fire prevention measure, but here it's just dirt. At my house, dirt equals weeds, but I guess that doesn't apply here. The trail continues on and so did I, south up the mountain. But as I was so slowly making my way along its sometimes steep ramps, a thought kept nagging: Someone built this trail for a reason. It has to go somewhere. I was hoping that, whatever that "somewhere" was, it wasn't inhabited. 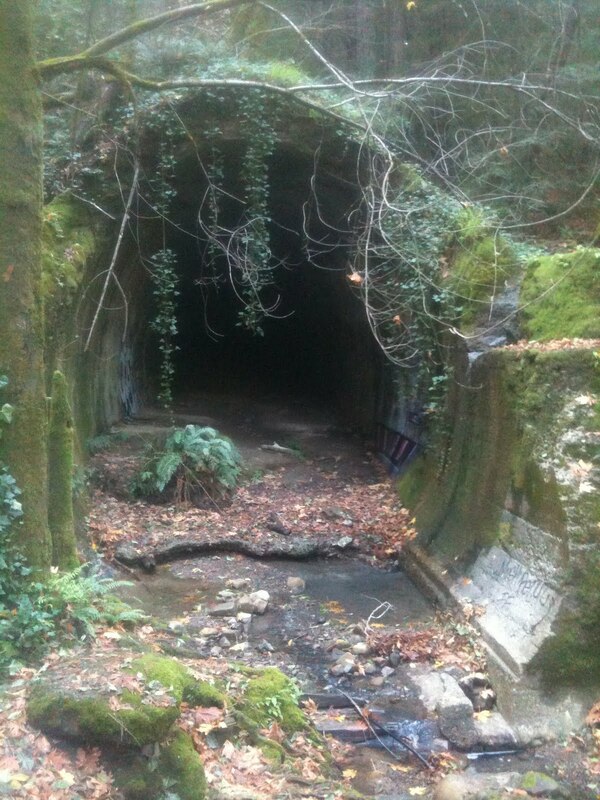 That seemed pretty likely, given the overgrown trail, but one never knows. Past the big dirt oval, the path heads uphill. Partway up it passes by an even smaller path that heads up onto the ridge. 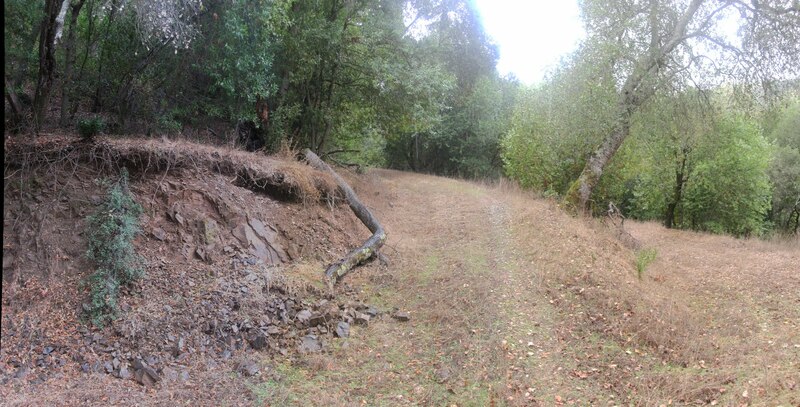 I think that smaller path, which was far too steep for me to ride, heads up to a rock formation. Because I was too nervous to leave my bike for long, I'll never know. A little further along, the trail comes to a water tank. Maybe that's where it was heading? The trail does indeed end there... or does it? No, it looked like it ended, but it heads up a hill that, given the soft conditions, I had to push my bike up. After winding around for a while, the road comes to a steep downhill. If I go down, I'll likely have to come back up, and having just been shamed into walking my bike up the hill, I decide to take the better part of valor and turn around. That's enough for today. Did I mention it was a beautiful day? That and a few hundred yards of descending can really do wonders for one's ambition. So when I got back to the pond, I decided to take the path that goes around it the long way. If I'm going to go to the trouble of coming here, I might as well hit all the paths. The path around the lake is ridiculously perfect. It's well constructed, flat, with a light coating of leaves and a nice canopy overhead. Having ridden down the path and back, I'm no longer worried that there's someone squatting out here. I'm all alone in this beautiful wood, on a glorious fall day. I'm exploring some place I've never been. And it's not even uphill! I'm sure I must have been grinning like an idiot this whole time. The trail soon meets an open area, and it's pretty clear that it dips left, closer to the lake, and goes around. But it also heads to the right. Where does that go? Only one way to find out. I continue on, and find myself riding south along a ridge line, with a view to the left (ie east) of the Hicks Creek valley, and Reynolds Road on the next hill. To the left is a pretty steep drop, and to the right is a steep climb. In the middle, one happy bike rider. This section is basically flat, and eventually reaches an intersection. By now I've twigged; this likely meets up with the trail I was on. I go to the right at the intersection, and indeed it meets up at the top of the hill, the one I didn't want to climb back up earlier. Now I've climbed this damned hill (about 1500 feet) from both sides, and I'm cooked. Did I mention that it was a beautiful day? 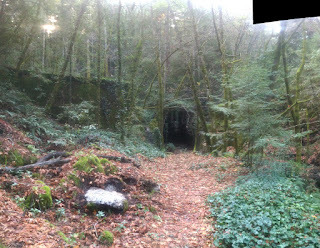 That and the brief but refreshing descent give me the energy to explore the remaining cleared area. By now the clouds had broken up a bit, so we had puffy clouds, blue skies, and still cool temperatures. The last exploring done, I went back down the road, squirmed past the gate, and was soon confronted by a reminder of why they call this Pheasant Rd. After waiting for them to pass, I coasted home. It was a short ride -- only about 12 miles all told, but with all my exploring, it took a good two hours. About 2000 feet of climbing. Possibly the most enjoyable ride I've ever had. Inspired by the old ride reports from the rec.bicycles newsgroup, I'm going to describe a recent ride through the Sierra Azul open space district. If you've spent time in San Jose, you may have noticed a mountain on the southern edge of town with a giant cube on its peak. The mountain is Mt. Umunhum, and the box is the remains of a radar dish platform, the focus of an abandoned air force base. Since I moved here a few years ago, quite close to Umunhum, it has been a curiosity, and I've ridden up to it several times. The actual base is closed, and the approach is marked with serious-sounding "no trespassing" signs, but I've at least got up to the gate a couple of times. Meanwhile, if you look at a map of the area (or better yet a satellite image), you'll notice that there's some sort of road between Umunhum and Loma Prieta. And you can get to Loma Prieta via Summit Rd. And you can get to Summit via Los Gatos. At about 45 miles, the route from my house over Loma Prieta and Umunhum and back home is at the ragged edge of my range. So it looked like a nice way to spend a day. I set out on my epic journey in late June... only to find that the Los Gatos Trail was closed, and my plans dashed (I didn't yet know that you could get to the Lexington Reservoir through St. Joseph's). So I detoured into a different ride. 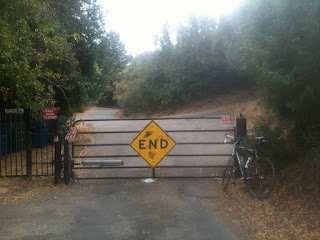 A week later I tried the same thing, but drove to Lexington Reservoir to skip the closed trail. 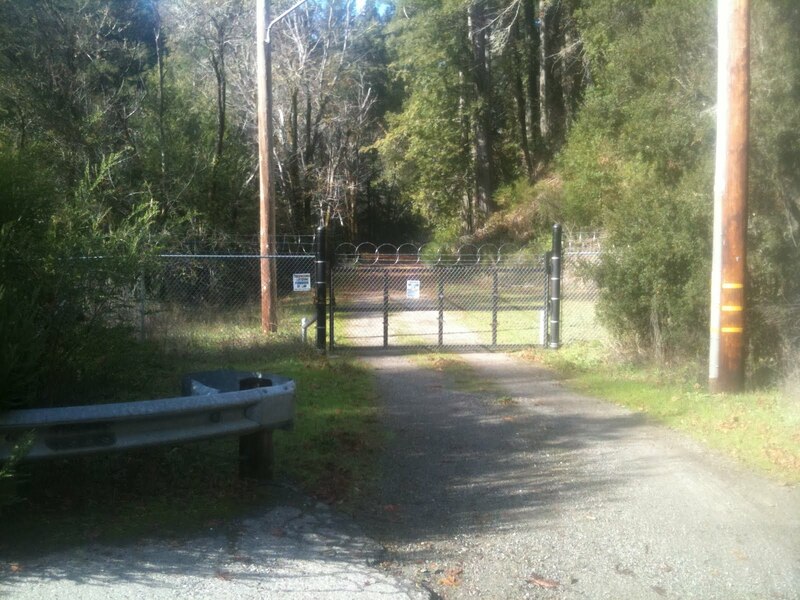 This time I got to Loma Prieta, but balked at the remaining climbs and returned to the car. About a month later, in early August, I set out for real. I rode my mountain bike, partly because the roads near the summits are dirt, but mostly because of the lower gears. I'm hauling a lot of weight up those hills. 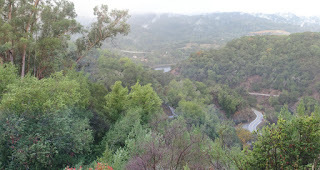 I rode through Los Gatos, down the Los Gatos Creek trail, and then on Alma Bridge Road to the southern part of the reservoir. I rode up Old Santa Cruz Rd to Summit, and I recall thinking at the time that I was, even then, basically climbing Loma Prieta. Summit Rd is at about 1500 feet in this area, and I started at about 250, so I was about a third of the way up. But I was taking it pretty slow; I was almost two hours into the ride and hadn't quite covered 20 miles. Travelling southeast on Summit Rd, as I was, you can occasionally look to your left and see Mt. Thayer, Mt. Umunhum and the ridge heading off to Loma Prieta. Mt. Umunhum looks especially close, and it's seems odd at this point that you're riding right past it. I had the idea that this route was generally a circle, but in fact this section -- southeast to Loma Prieta, then back northwest to Umunhum, is pinched. Next stop was the Summit store, where I got a great deli sandwich and some sort of fake fruit drink. There's really not much better than sitting around on the patio of the Summit Store on a beautiful day. It wasn't hot (it hasn't been all summer), and earlier on Summit Rd. I had seen the day's last fog still hanging around the treetops. At the table next to me a bunch of road bike riders were swapping stories. I could have stayed much longer. Eventually I packed half my sandwich and headed back to Loma Prieta Ave, which in this area is a one lane road that hops up onto a ridge, passing by a Christmas tree farm, a little vinyard, an orchard, and so on. It's also a straight relentless climb, which I must admit is my main memory of it. That's a shame, because it's a charming little one lane road, with nice views of the valley to the south. And in the grand scheme of things, it's not even very steep. Loma Prieta Ave starts curving around into an even more charming section that follows the hillside. There's a sense of solitude in this section, and great views across the valley. Shortly after this section, Loma Prieta Ave turns into a private driveway, and a dirt path leads down about half a mile to a little cluster of houses near Mt. Bache Rd (according to this note, Loma Prieta was briefly called Mt. Bache in honor of the accomplished surveyor). You drop 150 feet on the dirt road, which would be welcome except you just know you're going to have to climb it again. At this point Mt. Bache Rd. turns into Loma Prieta Way (according to Google maps, anyway), and starts immediately with an intimidatingly steep ramp. 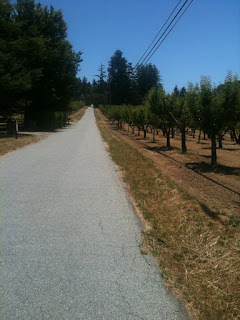 After a little more climbing, the Loma Prieta Winery passes by on the left. I must remember to try their wine. By this time, the road is back up at 2500 feet or so, and is more or less flat. 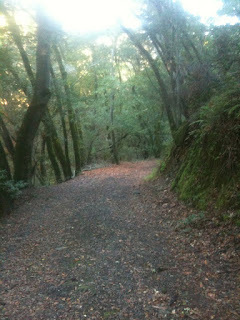 What follows is, for me, the hardest part of the ride -- about a mile that brings you up 500 or so more feet. Not the steepest climb in the world, but for my old legs this comes late in the game. A few flat miles later, you reach a decision point. On the one hand, you have Summit/Mt. Madonna Rd, which heads generally downward toward... well, Mt. Madonna. I haven't done that, yet. 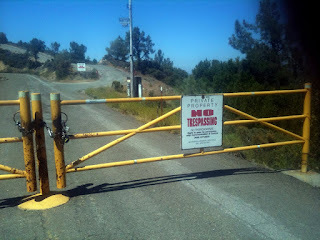 The Loma Prieta Rd, on the other hand, turns to dirt, and heads past the first "No Trespassing" sign. The steepness of this little section is perhaps more intimidating than the sign. 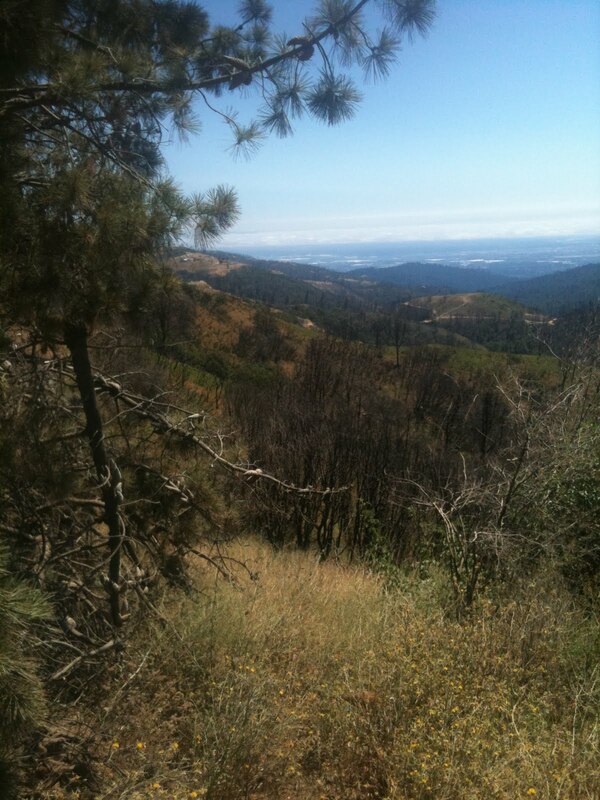 From this point, you can see all the way to Monterey Bay, not to mention down Summit Rd and whole valley. While I was there, a helicopter was making slow passes over the valley. Mysterious. Anyway, up the hill, and the last couple hundred feet of climbing. I had been to the top of Loma Prieta once before (and most of the pictures here are from that earlier trip). It was very disappointing to me that the road doesn't get particularly close to the top. I rode up toward the top, only to find yet another gate, a couple hundred feet below the summit. But this time that didn't bother me much, because I had bigger fish to fry. I rode around the peak, past another gate, and saw a little spring that may be near the source of Los Gatos Creek. 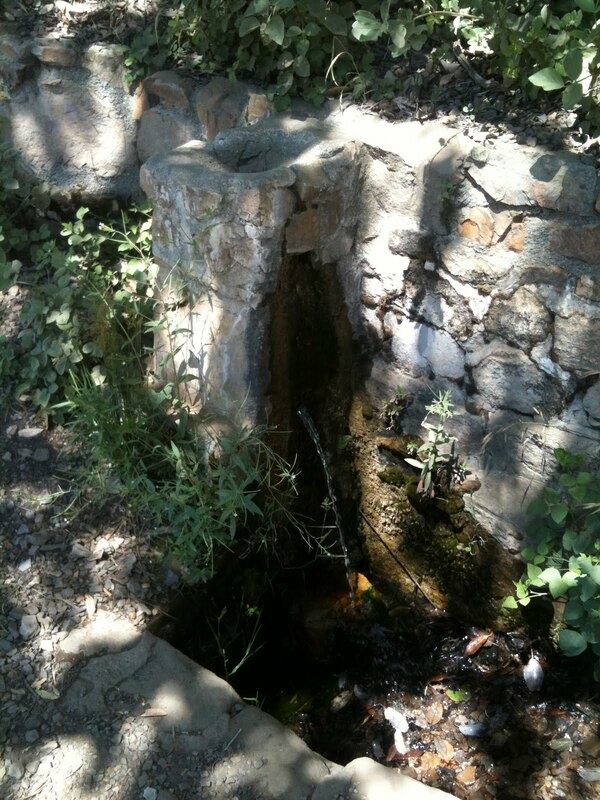 I didn't try drinking from it, but it flowed pretty well and looked clean. Riding around the peak clockwise, on the cleverly named Mt. Umunhum Loma Prieta Rd, you actually reach the highest point of this ride near the northern end, near another dirt road that heads toward Mt. Chual and Crystal Peak, the other antenna nest up here. This road between Loma Prieta and Umunhum is a nice, wide descending dirt road. Having heard all the stories, I was a little nervous riding through this area. No more than a quarter mile from the high point of the ride, you get your first surprise: a collection of cars at an intersection, signs of life, followed pretty quickly by yet another gate. One wants to get beyond that gate quickly, I can tell you. Immediately past the gate, the road does a U-turn. But that's not entirely obvious, because a trail heads off almost straight. 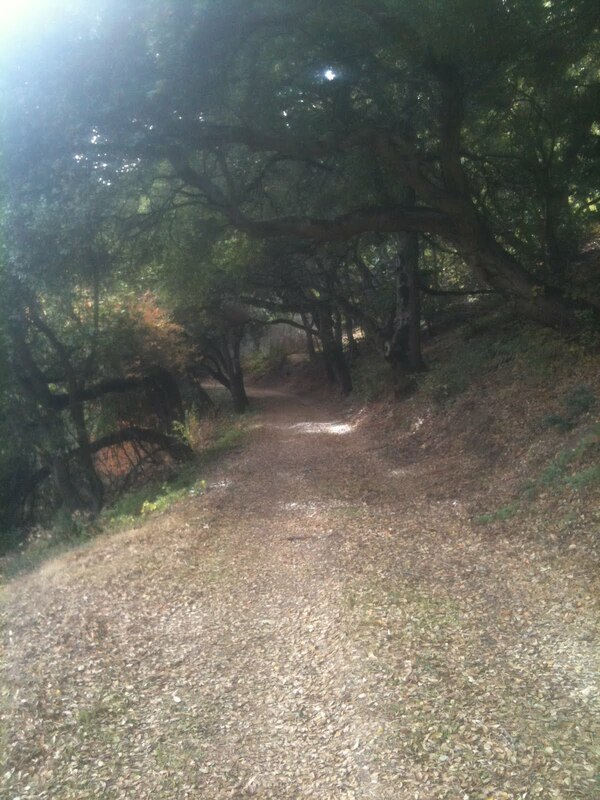 According to maps, this trail leads down toward (but not quite to) Alamitos Rd, near the Almaden Reservoir. I haven't explored that trail yet, and I'm glad I didn't accidentally do it on this trip. The road through here is really dug into some woods, so although you're basically on a ridge you don't get much in the way of views. That changes as you turn northwest, and you get a great view of the Los Gatos Creek valley. I know I must still have been nervous on this part of the ride, because I didn't stop and take pictures of a really spectacular view. Cathermola Rd peels off from this road heads down into the valley. 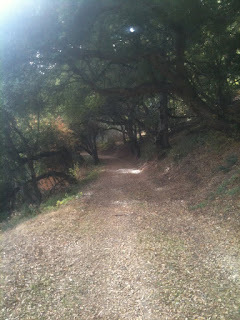 Immediately afterward, you begin the 300 foot climb back up toward Umunhum. At the top of this climb, according to the maps, you have the choice of going left or right around the little shantytown immediately before Mt Umunhum road. When thinking about this ride, I studied the maps and read some other ride reports. Bill Bushnell, writing in about 2005, recommended going right to avoid going too close to the dwellings. So I knew, when I got to that point, that I would head right. In the event, there were a couple of cars parked right at the junction. And not junkers, either -- cars that looked like they could actually move themselves. The main road continued left, but the path to the right was small, overgrown, and easy to miss. 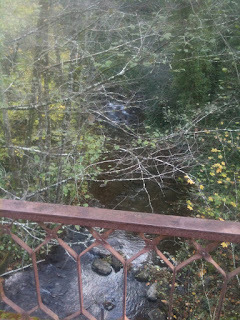 As I rode down it, I wondered more than once whether it was even passable anymore. Technically it wasn't, for me -- in a couple of places I ended up carrying my bike through waist-high bushes. At this point I've already crossed several gates and blithely ignored plenty of signs. I could rationalize all that. But on this clearly disused trail, you really feel like you're skulking around, definitely doing something wrong. It ain't the high road anymore. But I wasn't about to turn back, either. There's a point, and you can see it on a satellite map, where you suddenly come upon a couple of old trailers connected by blue tarps, sitting directly next to the trail. I think it was here that my Garmin registered my highest heart rate. But I never saw or heard anyone. 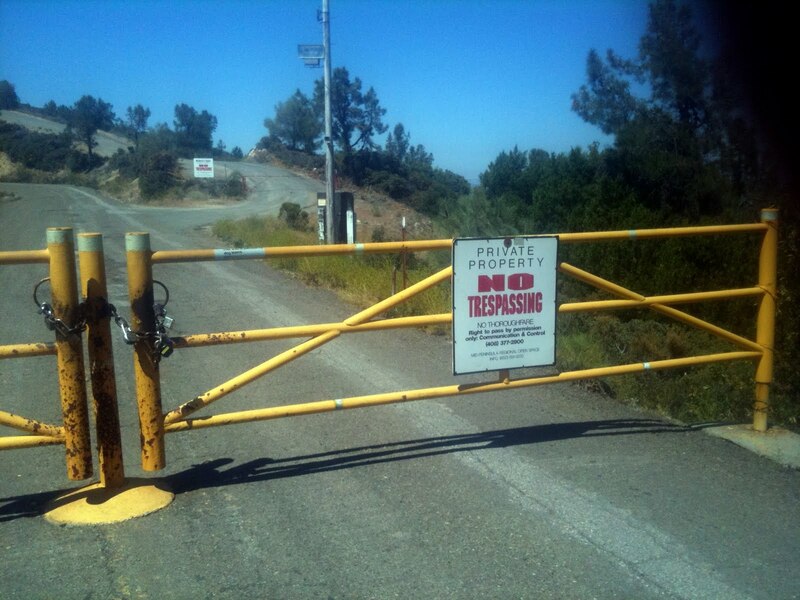 Over one last gate, you get to Mt Umunhum road, in all its military/industrial glory. I rode up to the gate, just to remind myself of the arrangement. Once again, blocked a couple hundred feet from the top. Turning around, it's almost literally downhill all the way home, and apart from stopping twice to let my rims cool, completely uneventful. In the end it was about 42 miles and took 6:20 (an hour of which was resting), with almost 4800 feet of climbing.